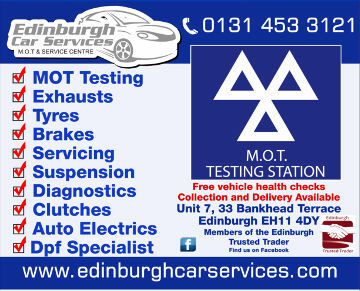 Looking for a garage to fix your Cambelt in Edinburgh? Save money: Instantly compare Cambelt Repairs prices in Edinburgh to find the best deal. Quick and easy: Simply enter the registration number of your car and your post code, compare prices, choose a local garage in Edinburgh and book your Cambelt Repairs. "First time using this garage as they had been recommended to me. Car returned very quickly. They Contacted me before doing any work to ensure I was happy to go ahead and the price. Will definitely use again." "The workshop and the quality of the work and service are great"
"Super efficient MOT with clear explanation of what was going on. I muddled up timings and they still managed to fit me in for the day. Good job boys"